Whether she’s helping her club team to another French Cup, pushing Canada toward its goal of being No.1 in the world, or teaching six-year-olds how to pass, Canadian soccer player Ashley Lawrence finds ways to shine light on women's soccer for all the right reasons. Ashley Lawrence is a big reason Canada's women's soccer players are associated with words such as "performance" and "results," instead of "twerking." 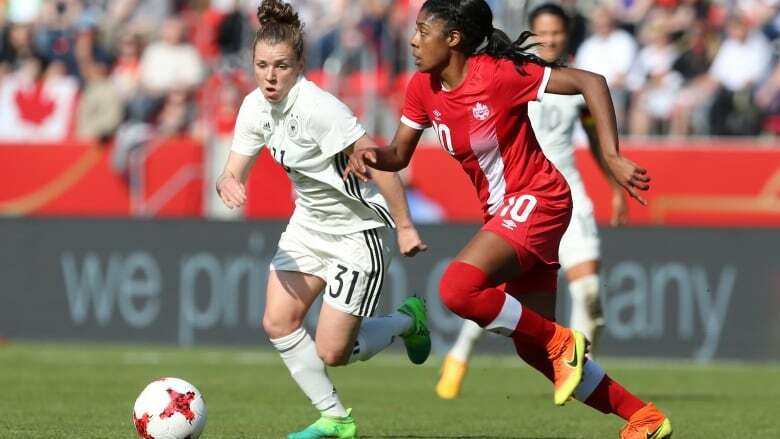 The 23-year-old midfielder from Brampton, Ont., is a key member of Canada's lineup heading into next year's Women's World Cup in France. She also recently received a four-year contract extension with her club team, Paris Saint-Germain, where she's played the past two seasons. And in the wake of Norwegian footballer and Ballon d'Or winner Ada Hegerberg being asked whether she could "twerk" after becoming the first female winner of the award, elevating the conversation around women's soccer is more important to Lawrence than ever. "I think it's incredible to have this platform," she told CBC Sports via Skype from her Paris apartment. "And Canada is a crucial part of it, being one of the top five countries in the world. "We know it's more than the game. It's what this really all represents." The Women's World Cup — which runs from June 7 to July 7 — is one of the biggest platforms Lawrence and Team Canada have to carry out that role. The 2015 tournament, held in Canada, drew record-breaking numbers with a total television audience of more than 750 million, making it the second most-watched FIFA competition behind the men's World Cup. "After the last World Cup, just seeing the support from fans all over the world, buying into women's soccer is just incredible," Lawrence said. "We have young girls looking up to us and I think [Team Canada] understands that responsibility. "We're representing Canadians and other females that are striving to be whatever they want." Lawrence is confident Canada will put on a good showing in France, after finishing sixth in 2015. The team has been working on building the on-field connection between veterans and their new, young players. Lawrence also credits friendly matches against top-tier teams in Canada's preparation for a tournament with no easy groups. Canada is in Group E, alongside the Netherlands, New Zealand and Cameroon. Lawrence likes her role on the team, one that differs from her role with PSG. "Now that I have some experience under my belt, I feel like I can help those that are younger, or even my age," Lawrence said of her position on the national team. "But also bringing that energy and freshness to the team … even if it's only one per cent. "So I'm a little bit of a link on the team." On PSG, Lawrence has more of a leadership role. "I try to bring my experience from the national team," she said. "Whether it's on the field, off the field, just being that voice and adding that energy… I really learned that with Canada. "I think for me it's how can I impact the player next to me?" Lawrence strives to lead off the field as well. She holds an annual toy and food drive called YesSheCanada where, in return for a donation, girls from six to 16 can participate in soccer workshops in Brampton. She says it's her way of getting young girls involved and connected with role models in sport, something Lawrence says she didn't have growing up. And Lawrence sees Hegerberg's experience with a crass interviewer as just another indicator of how much more work there is to be done. "I think it represented kind of the mindset of where women's soccer is at today," Lawrence said. "And for me that's not okay that that happened." So whether she's helping her club team to another French Cup, pushing Canada toward its goal of being No. 1 in the world, or teaching six-year-olds how to pass, Lawrence continues to work on changing headlines. "I'm hoping that we can continue to have conversations like this where it's positive and we talk about the accomplishments in women's soccer like the last World Cup and all the coverage and how much the fans got into it," she said. "I think it's important to have those conversations, but also focus on the positive in women's soccer."